0.8mm hand brushed finish stainless steel. Brass tap finished in polished chrome with 25cm flexible connectors. Supplied with 90mm and 50mm basket strainer wastes, clips, seals and chopping board. Complete with waste and overflow. 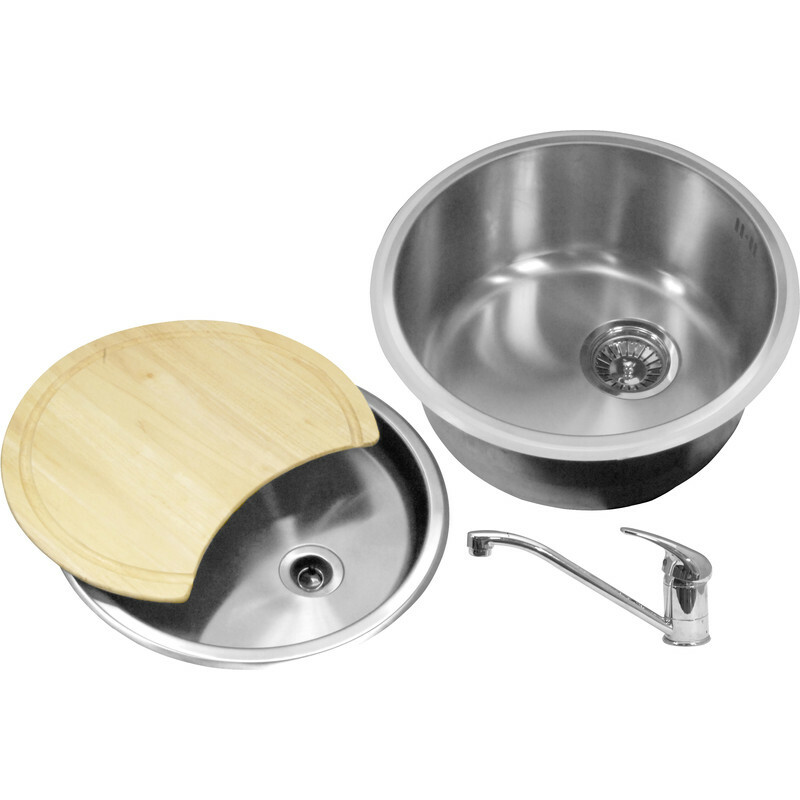 Round Bowl Kitchen Sink & Drainer Kit 440 x 185mm Deep is rated 2.0 out of 5 by 3. Rated 1 out of 5 by Rogiet Property Services from Avaoid at all costs. This is or looks like a good deal and well presented product and to be honest it is not bad value but the package I got included a previous attempt at fitting and I believe was returned, its very poor in quality and required an unorthodox method of installing! The end result was still excellent and didnt compromise my clients expectations. Rated 1 out of 5 by Anonymous from Double sink letdown This sink kit was a bargin, untill you fit it. Waste kit is poor, main sink has issue with clamps holding it down. Looks great but it's in need of some work. You need lots of silcone. Rated 4 out of 5 by Beaker from Great value for money Bought this having had a similar setup from another supplier some years ago. It is a great value for money package. The tap is of decent quality and works really well fed from my unvented system. Couple of slight niggles. The clamping lugs on my sink were slightly misplaced and it did not fit the cutout as specified, drainer was fine in the same hole. Minor adjustment to the cutout and it went in fine. The bigger niggle is that the waste fitting supplied with the drainer is an odd size. This is fine for a standard side by side install in the same cupboard space but a bit of an issue if you want to use a standard trap with the drainer. My installation was above an RO tanked filter system so needed a different waste layout to standard. Easy to sort but be aware.